In this survey I’d like to know what your experience is using the DBCC WRITEPAGE undocumented command. This survey is closed – see the editorial here – thanks! It’s been a hectic January with client work and preparations for our 2014 classes so I haven’t blogged as much as I wanted, but I have lots of blog posts coming up over the next month! 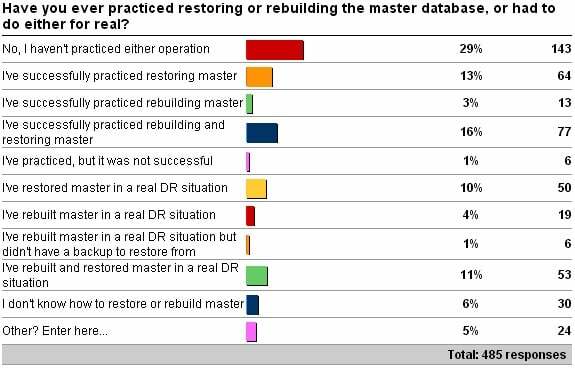 I’m very pleased to see the results – almost 60% of respondents have successfully restored or rebuilt the master database, either in practice or for real. If master is damaged so that the instance will not start, you can either rebuild master or re-install SQL Server. Which amount of resultant downtime would you rather deal with? If you have to restore master and you don’t know how, or you don’t have a backup of master, then you have to rebuild master – go to reason #2 above. And you’re off and running again. Steps 6 and 7 can be mitigated with documentation of all changes made to the instance (you all do that, right?) and making sure that a master backup is taken regularly (e.g. every night). I demonstrate it live when I’m teaching and I walk through the steps in a demo in my Advanced Corruption Recovery Techniques course on Pluralsight (Module 5). Restoring master is not hard. Rebuilding master is not hard. But the very fact that it’s master makes it a bit scary. And rightly so – if you mess it up you may be looking at a re-install. You certainly don’t want to be doing either of these for the first time ever during a real-life disaster recovery situation. Practice, practice, practice – is the key to successful disaster recovery, no matter what’s involved.